Change is coming to the Buccaneers defensive line. You only need one hand to count how many snaps defensive end Noah Spence has had this season. The No. 39 overall pick of the 2016 NFL Draft has been a bust unable to crack the lineup on the NFL’s worst defense. But that will change Sunday. 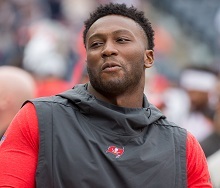 Dirk Koetter announced on his Buccaneers Radio Network show this evening that Spence will be active against the Browns and will play. “Noah will be active and he’ll get a chance to get in there and do some damage,” Koetter said. Vinny Curry and Gerald McCoy are out with injuries and Spence now has a chance to change his career. Whatever has been going on with Spence, it won’t matter any longer if he can produce. Ok Noah Spence, here you go, this is your chance. — This is your chance to make a statement and to make some plays to show that you are going to be a factor on this team going forward. — Take hold of this opportunity and MAKE something of IT. But will he play special teams?! But can he pass block though???? He must be in ecstasy! oops, poor choice of words. Spence needs to show something in this game. For his sake and Jason Lichts’. My God with this guy……just show up and get shut down so we can release you and forget about you. Three years of this guy and I’m sock of his ugly face!!! Will he play on running downs? Looking forward to Noah playing too! Well said TBD. Go Bucs! I heard Duffner was asking Spence today if, Molly wanted a cracker? I’ve already seen more from Carl Nassib than I have Spence. He’s our future starter. Noah Presence is going to shock the world. MULTIPLE SACKS NOAH!!! SHOW US WHO THE MONSTER SPAWN REALLY IS!!! I see the comments about the drugs, has there been a report that I haven’t read that details that is or was his issue? I know there was talk about gaining a lot of weight and loosing it which would point to a PED, but I haven’t read anything confirming that. i haven’t heard anything about this inside the publics supermarket i chill at…what’s going on??? another poser….sheseh, get rid of these posers already!!!! rich guys posing as football players….im SICK OF IT!!! GTFO!!!! Get after it Sunday and show us how you got over five sacks with a bum shoulder! I also hope Nassib gets some sacks too so JPP doesn’t get double teams all day! Way to go numbskull! Starting some baseless drug talk without any evidence whatsoever. Against someone on this team. 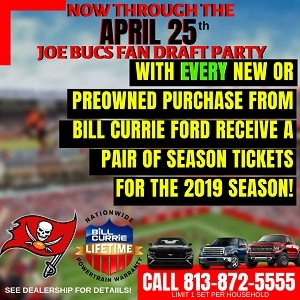 You call yourself a Bucs fan? No excuse for that garbage. Go Bucs! How many Bucs players were at 2001 this week? Terrible defense now besieged with injuries, it’s hard to see this team winning more than 4 more games this year, at best. This team really needs a new coaching staff, one that is more hard-nosed & attentive to details. You need a new guy in charge of finding talent as well, because they are going to find at least three stud defensive players next year to have any hope. I hope I’m wrong, but the guy has nothing at DE and unfortunately tomorrow will probably more of the same. He should be playing OLB, not DE, but what do I know….